North west of Toronto on the NSW Central Coast, Heaton State Forest is bordered by Awaba and Watagan State Forests and Watagans National Park. The Great North Walk runs through Heaton State Forest. Forests in this area have been harvested for timber for many decades – some for over 150 years. The forests you see today are regrowth forests which means they have been harvested many times over and grown back. Today's forest management practices protect biodiversity, soil and water quality and cultural heritage sites while also allowing for sustainable timber production. NSW State Forests – here today, here tomorrow. Find out more about sustainable forest management. The State Forests of the Watagan Mountains (Awaba, Heaton, Olney, Ourimbah, Watagan and Wyong State forests) have won the Gold Award for Adventure Tourism in the Hunter Central Coast Tourism Awards in 2012, 2013 and 2014, earning their place in the Tourism Hall of Fame. 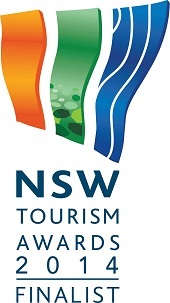 They also received a bronze award in the tourist attraction category in 2011, won the silver award for adventure tourism at the NSW Tourism Awards 2013 and are finalists for the 2014 NSW Tourism Awards. Named after Richard Heaton, an English convict who became a timber cutter in the area, Heaton Forest Park contains a picnic area and nearby lookout. The magnificent coastal and mountain views provide a majestic backdrop for having a picnic. Two walking trails also commence from the forest park including the Heaton Loop Trail and the Watagan Trail. Heaton Lookout is named after Richard Heaton, an English convict who became a timber cutter in the area. Heaton Lookout provides magnificent coastal and mountain views and a picnic area. Breathtaking views of the Hunter Valley, Pokolbin Range and the mountain ranges of the lower Barringtons can be seen from Hunter Lookout. Small mining towns of the Hunter Valley, Sugarloaf Range and views of the surrounding Watagan Range can also be had. These views provide a great backdrop for having a picnic. Similar to Hunter Lookout, McLeans Lookout offers views of the Hunter Valley, Pokolbin Range and the mountain ranges of the lower Barringtons. Some of the small mining towns of the Hunter Valley, the Sugarloaf Range and views of the surrounding Watagan Range can also be had. During the 1940s, Watagan Headquarters was the site of a camp for workers constructing forest roads. It was later used as a camp barracks for maintenance crews who were trucked into the forest on Monday morning and out again on Saturday morning. The headquarters is on the route of the Great North Walk, a 250 kilometre walking track from Sydney to Newcastle. The camping area is open and grassed, surrounded by native forest and blue leaved stringybark plantations.